In today’s social world, everyone is using a wide variety of corporate, cloud and SaaS apps and social media across a wide variety of personal and company devices—laptops, tablets, and phones. Don’t burden your employees bringing their personal devices to work (BYOD) or important guests with complex sign-ons and passwords for every device. And eliminate the worry from security loopholes for guest access. Offer your employess and guests immediate, secure access for all their devices. SteelConnect, Riverbed’s next generation SD-WAN product, enables policy enforcement based on user identity—not just the IP address, for control of access, secure direct access, mobility, and the ability to ensure the same experience on all the user’s devices. SteelConnect provides an easy and intuitive way to define any network access, including the Internet, by user identity. 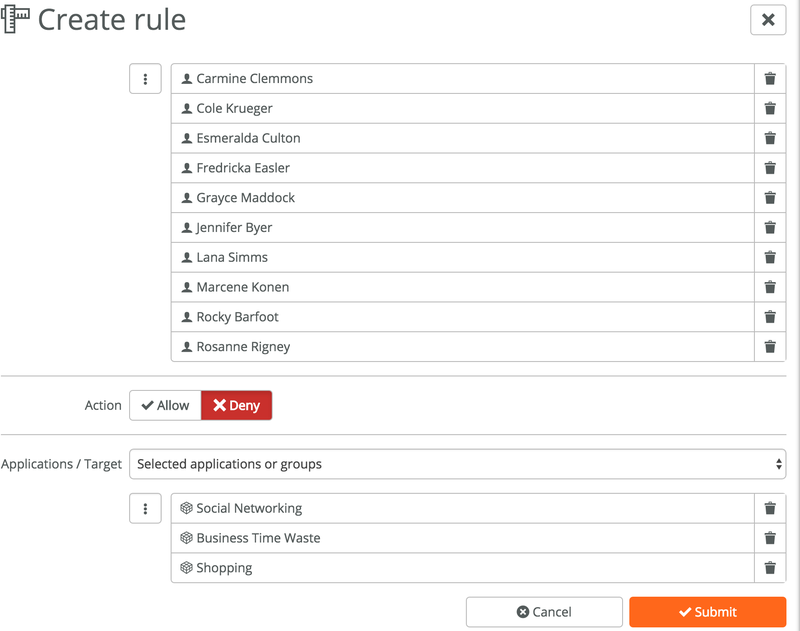 You can identify users by name, roles, or job functions. You also can add users manually or automatically populate them using directory synchronization with Windows Active Directory or Google Apps. And you can perform Active Directory synchronization for corporate users even if they are in a remote location, such as a branch or home office. SteelConnect allows you to set up separate self-registration portals for employee and guest devices for secure control of device proliferation. Employees can register their personal devices into their own user account through a loopback email or SMS text authentication according to the policies established for the user account. For convenient guest Wi-Fi access, the user can self-register each device in a matter of minutes within the guest portal. Then the administrator attaches the security policy and guest restrictions to each registered device and allows the device to join the guest Wi-Fi network. Web content restrictions and malware filtering are based on the SteelConnect policy you set up, for example. Once the guest user is authenticated via the authentication portal or social media and the identity-based registration is completed, SteelConnect directs all guest traffic over the Internet—with a firewall between the guest zones and the internal zones. The guest network is never able to connect to the secured corporate zones or VPN. SteelConnect also offers secure enterprise-grade mobility and Wi-Fi for guests, employees, and Internet-enabled devices across all locations. Users are assigned to a virtual network zone only once. Then SteelConnect zones automatically follow users across all locations, no matter which device is used. Thus, with simple, authenticated self-registration of multiple devices in the SteelConnect user portal, every user is securely managed according to a business policy set by you for that user and his or her devices. Simple: Users self-authenticate laptops, tablets, and phones all at once using email or SMS (texting). Compliant: Consistently enforce data protection and security policies company-wide. Social: Leverage the opportunity to communicate with your customer through email, Facebook or SMS. Secure: Define Service Set Identifiers (SSIDs), which use Wi-Fi protected access 2 (WPA2) for security and include a randomly generated password. Easily create dedicated SSIDs for guests. Complement self-registration with SteelConnect reporting. Then you always know exactly who is on your network and what that user is using. Try our self-guided demo demonstration today!